Live Nation announced today that Sting, accompanied by the Royal Philharmonic Concert Orchestra, will embark on a world tour this summer. 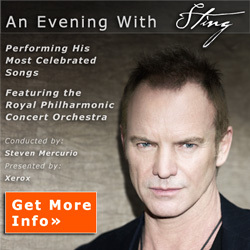 The tour will find Sting performing his most celebrated songs re-imagined for symphonic arrangement. The Royal Philharmonic Concert Orchestra will be conducted by Maestro Steven Mercurio (Pavarotti, Bocelli). Presented in a variety of settings, the tour begins June 2 in Vancouver and then travels to numerous cities across North America. Dates announced today include: June 9 at Red Rocks in Denver; June 15 at the Hollywood Bowl in Los Angeles; July 17 and 18 at Chicago's renowned Ravinia Festival. Sting will also perform in New York, Boston, Dallas, Houston, Philadelphia, Portland, Seattle and Washington and return to Canada, with stops in Toronto and Montreal. Additional North American cities, venues and on-sale dates will be announced in the next few weeks, with other territories throughout the UK and Europe to follow soon. Never afraid to blaze the path of new musical territory, Sting's foray into the classical realm began with the crossover success of his #1 album 'Songs from the Labyrinth', a lute-based interpretation of the music of 16th century composer John Dowland, released in 2006 on Deutsche Grammophon. After completing the enormously successful Police reunion world tour, Sting returned to pursue his passion for uniting musical genres with his most recent release 'If On A Winter's Night...' which debuted at #1 on Billboard's classical chart and remains there. Sting's interest in collaborating with an orchestra began in 2008 following an invitation to perform with the legendary Chicago Symphony Orchestra. After reworking selections from his expansive catalog, he and several members of his longtime band joined the orchestra in a performance that left an indelible mark on Sting. Eager to explore the possibilities of further symphonic collaboration, Sting was excited when the Philadelphia Orchestra asked him to join them in commemoration of the 153rd anniversary of the Academy of Music. "Performing with both the Chicago Symphony Orchestra and Philadelphia Orchestra was truly a highlight of my career. I'm delighted by this new opportunity to tour with the Royal Philharmonic Concert Orchestra and reinterpret the songs I've been playing for many years," commented Sting. The tour is promoted by Live Nation and produced by RZO Entertainment, Inc. in association with Universal Music Classical Management & Productions. We are pleased to have Xerox as the tour presenter. We are also delighted to have Starwood Hotels and Resorts as the official hotel partner. "As one of the most celebrated artists of our time, we're thrilled to be the Official Hotel sponsor of the 2010 Sting tour. This sponsorship provides a distinctive opportunity for us to reward our loyal members by connecting with them through their passion for music," said Phil McAveety, Chief Brand Officer for Starwood. American Express Cardmembers have the exclusive opportunity to purchase advance tickets to Sting for the performances in Denver and Los Angeles from Monday, March 1st at 10am (local time) through Sunday, March 7th at 10pm (local time). Tickets in Los Angeles, Denver and Vancouver go on sale to the general public beginning on Monday, March 8th at 10am (local time). Fan Club presales for the performances in Vancouver, Denver and Los Angeles will go on sale from 10am (local time) on March 5th until March 7th. Legacy members will have a one hour exclusive window on the presales before they are opened up to all members. Fan Club members will be able to purchase up to four tickets per show in the presales. Tickets for the above shows go on sale to the general public beginning at 10am (local time) on Monday, March 8th. The SPG program's breakthrough policy of No Blackout Dates at the world's most sought after collection of hotels, reinvented the hospitality loyalty program when it launched in 1999. By creating a program centered on its members, SPG has developed the most passionate and knowledgeable membership base in the hotel loyalty space. Through its use of new technologies and innovative channels such as SPG.com, SPG.com/stayconnected, SPG.com/flights, thelobby.com and others, SPG continues to innovate and lead the industry. By offering No Blackouts on standard rooms at 940 participating properties, No Blackouts on hundreds of airlines, and once in a lifetime experiences available through SPG Moments at spg.com/moments, the program has proven to be a big draw for the world's most frequent travelers. It is also a significant competitive advantage for Starwood and its nine distinct and compelling brands: St. Regis, The Luxury Collection, W, Westin, Le Méridien, Sheraton, Four Points by Sheraton, and the recently launched Aloft, and Element SM. With the world's largest portfolio of upper-upscale and luxury hotels, SPG members enjoy unrivaled access to distinctive, aspirational experiences located in premiere destinations in nearly 100 countries. For more information about Starwood Preferred Guest please visit SPG.com or call (877) - STARWOOD. Speaking of the upcoming performance by Sting, Mohammad A.Nasser Al Khayat, Commercial Director of Meydan said: "Sting is not only one of the best in his field, a perennial performer who has seen not only international success but also longevity in his career span. He appeals to both young and old and is a true citizen of the world who cares about the people and the environment around him. Sting represents many of the values Meydan upholds for itself, as we hope to set the same benchmarks when it comes to international racing, the same way Sting has achieved worldwide acclaim over the course of his career..."